I am super excited to share today's post and the upcoming two more posts about Suqqu Fall 2015 Collection. I have started testing Suqqu Blend Color Eyeshadow 20 Kaoribara last weekend. Then what happened is that I couldn't stop testing! There are a few more items that need to be photographed from other Fall Collections as well as Suqqu but the bordeaux/burgundy hues, they are too stunning to go past it. So I decided to stay there and enjoy. I came up with two different looks which I would like to share with you today as well. Hope you enjoy them. Matching to the palette, I also have one of the new Suqqu Gel Eyeliners in limited edition color Bordeaux. 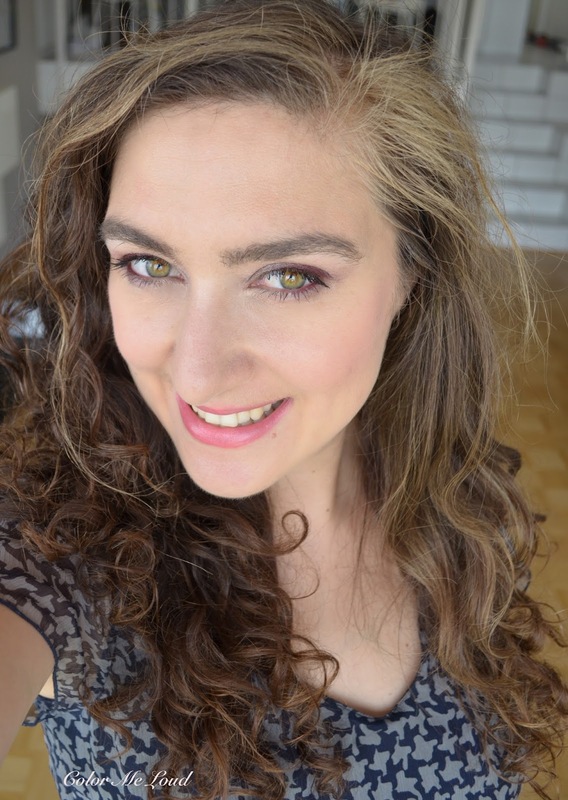 This is a new product at Suqqu Line-up so I am excited to share my thoughts on that as well. Right after the *jump*. As usual I have to start a Suqqu review by showing my terribly non-existing Japanese skills to the world. Bara (薔薇) means "Rose" and Kaori (香) means "Fragrant". So my best guess is that Kaoribara means a rose which smells divine. 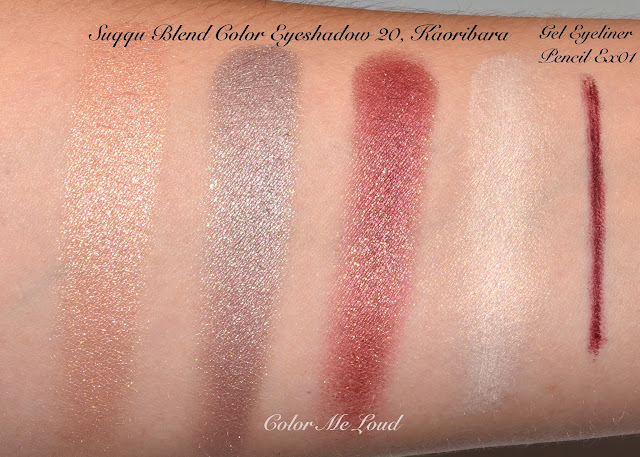 Suqqu Blend Color Eyeshadow 20 Kaoribara is a stunner. It is an unusual combination of red with gold shimmer, a cool taupe and a rosy peach. The difference of this particular quad and others in the collection is that they all have a cream base color instead of a powder one. Now you might think that cream and powder in a product is not the best combination but bare with me because it actually works much better on me than the powder bases of Suqqu I used so far. All the three quads in Fall 2015 Collection has "Suqqu" written with an overspray on the bottom left shade. This unfortunately goes away by the first usage but still super pretty to look at. I am trying to preserve mine by using the shade from the side with the other quad, it is a sweet challenge. You can see the full product list at lovely Rouge Deluxe website here. There are three Blend Color Eye Shadows, one of them is limited edition, Ex-26, which I will show you soon. There are also three Gel Eyeliner Pencils, a black a brown and a limited edition shade Bordeaux, Ex-01. Bordeaux goes so well with Suqqu Blend Color Eyeshadow 20 Kaoribara. I am tempted to say they are like butter & bretzel but I'd better formulate it differently for Japanese make-up, what about like Sushi & Soja Sauce or Sashimi & Wasabi? Any more ideas here? Suqqu Gel Eyeliner is sleek and the product is disposed by turning the body in one direction. It is important not to turn it too much since it just works one way. If you have too much product out, you can't put it back again. Since it goes out very slowly, this mechanism works fine for me. At the other end of the pencil, you can find a sponge applicator for smudging. I love using this one because I don't like very defined eyeliners. Now as for the quality, I am not sure if I like the Blend Eye Shadow 20 more or if my obsession is this Bordeaux liner after all. It applies so smoothly, so fine and precise. You can smudge it easily with the sponge tip end and it sets and doesn't move. Like literally, you need something "strong" to get rid of it. Lately it has been too warm here and I end up with Panda Eyes if liner goes all over the place from my water line down, but this one is a champion. It doesn't move a cm! If you have problem with your liners propagating, make sure to check Gel Eyeliner Pencils out. Top left (powder): light golden peach with pink undertones and shimmery finish. This works beautifully as inner corner highlight on me but also as an all over shade or layered on red as an accent. 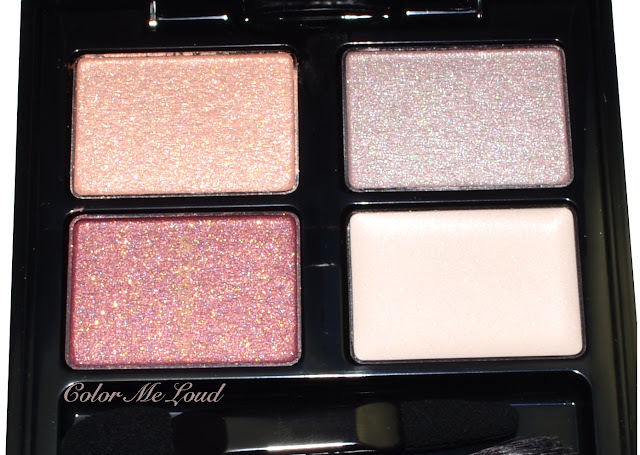 Top right (powder): the most stunning light to mid toned taupe with beautiful shimmer. I die for shades like this. Apply it all over your eye lid, you don't need any other makeup! It also pairs beautifully with the red shade for a little more drama while balancing cool and warm. Bottom left (powder): the star shade of the palette, a mid-toned to deep red with soft golden shimmer. If you know Suqqu make-up, you know what I mean about "soft shimmer". These appear in no way frosty or too shimmery, never emphasize lines or imperfections. This one is beautiful as all around color, as crease color, as liner, whatever you want you can do with it. 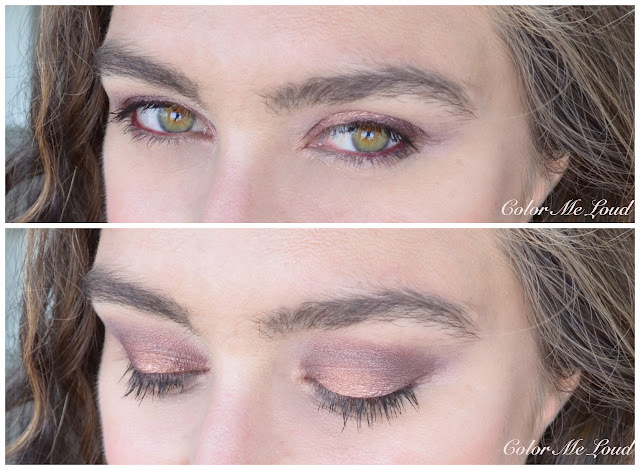 You can also see Gel Eyeliner Pencil Ex-01 Bordeaux swatched below. Its tip is super fine and it applies so smoothly. The shade is a little deeper than the red shade in the palette and it doesn't have any shimmer. It complements Suqqu Blend Color Eyeshadow 20 Kaoribara perfectly. Now onto the eye looks. I would like to show you how diverse Suqqu Blend Color Eyeshadow 20 Kaoribara is so I have two very different looks for you. The first one is for those who like it cool. After the cream base, I applied the taupe shade all over, peachy gold on inner corner and red on the crease. I completed this look with Gel Eyeliner Pencil Ex-01 Bordeaux along the upper lash line as well as on the outer half of the water line. I combined this look with cooler shades on the cheeks and lips. I am wearing Tom Ford Frantic Pink (my cheek uniform) and a discontinued Chanel Rouge Allure. Now on to second look, this one is warmer, with more red. From Suqqu Blend Color Eyeshadow 20 Kaoribara I applied the bordeaux all over the lid and layered the peachy gold over on the center. I applied a bit of the taupe around the crease to cool it down. I then lined the water line and the upper lash line with Gel Eyeliner Pencil Ex-01 in Bordeaux. For the rest of the make-up I am wearing Tom Ford Cheek Color in Ravish and Suqqu Creamy Glow Lipstick in 13 Akanebara. The review of the latter is coming soon although I smashed it a little during photo taking. 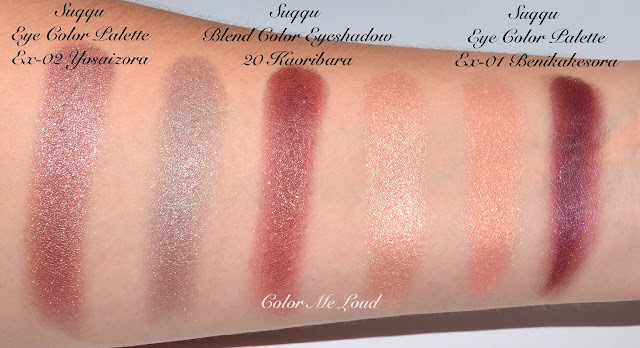 If you have Suqqu Eye Color Palettes in Ex-01 Benikakesora (reviewed here) and Ex-02 Yosaizora (reviewed here) from Summer 2015 Collection and wondering how these compare, here are some swatches for you. Ex-01 Benikakesora also has peach and a reddish purple but peach is less golden and a little cooler. It is also a little deeper than the golden peach in Kaoribara. Deeper shade of Benikakesora is clerly more plum, less red and less shimmery. Ex-02 Yosaizora's interesting taupe shade is very close to taupe and red in Kaoribara layered, yet it is different than the both. Availability: Suqqu Fall Collection will be released on the 14th of August at Selfridges and 28th of August at other stores in UK. Suqqu is available in-store at Fenwick of Bond Street, Harrods, Selfridges and Selfridges online. How do you like this shade combination? Are you eyeing anything from this collection? I am not pad for this review. All opinions are honest and my own. Hey Sara, oh these are shades that you pull off so amazing well but I'm just not sure on myself! I've been wondering if I should get a Suqqu brush or two, but haven't taken the plunge so far. Hi Sara, Suqqu has detected you! I am glad it happened :) This is a great palette, I also like the color combination, even though I find that highlighter colors should not be matte, especially when another light color is very warm and highlighter is necessary here. This palette and the khaki one (at least it looks as khaki on photos) are both on my wishlist. As they will be new permanent, I will buy them a bit later. I have too many similar red-burgundy-gold-khaki colors and I need to use them first. Wow, this is a very interesting color combo - I would never think to mix cool and warm shades like this together, and the shimmer is so pretty. Beautiful! I was in the Alsterhaus in Hamburg the other day and saw a line that I'd not seen anywhere else called Beauty is Life, and it made me think of this blog. 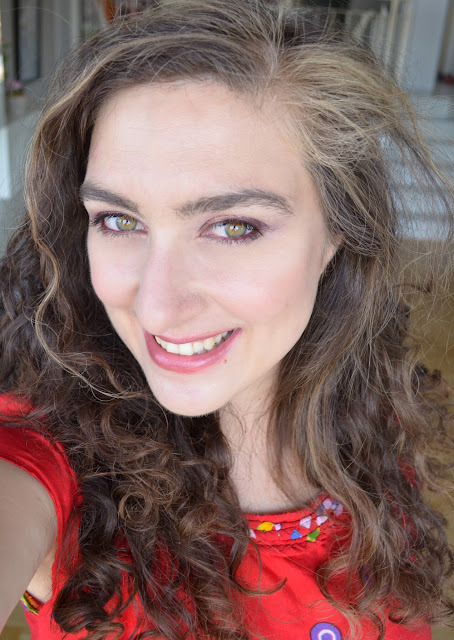 I had a play with some of the lipsticks and glosses and it feels very high quality, with a mixture of neutrals and more exciting colours (think Illamasqua) - have you heard of it? the warm look is so gorgeous i just want to SCREAM!!!!! thanks for sharing this with us!! which Palette are you eyeing most? I am not big on khakis but still I am planning to get the other permanent one as well. I will also post a review of the limited edition one soon. You gals are so lucky to have access to a counter there! I can recommend the cheek brush, that one is really amazing. As for the shades, there is a khaki palette in this collection, which I think you would like more. LOL Susan, this made me laugh. Blame the superb quality. And those shades are really to die for. Once you are at it, would you grab me the khaki palette too? I am not big on khakis but the soft shimmer is blurring my mind. yes this combination is indeed a must have for me for the upcoming season. The liner is coming in black and brown as well. These two shades are going to be permanent but the Burgundy shade is limited edition. She also gifted me the goat face brush with very long handle. I love how it looks but it doesn't have the resilience to be used properly, so I will be keeping it just for being pretty, not that useful after all. All in all, try before buy, the brand is a mixed bag. yes this palette is very versatile and oh so pretty. In real life it is even better because it twinkles under low light, so beautiful! It is permanent so hoping there will be more in stock. In the past some of the permanent palettes sold out at Selfridges and it took months until they were restocked so if you are sure to put it in your wish list, I wouldn't wait too long. that whitish color is not a highlighter, it is a cream base. This palette doesn't have a highlighter like you described but I think we have enough light shimmery shades in our stash for that. I prefer a shade which I can actually use on the eye lid. Khaki one, yes I need that one too, have to somehow get my hands on it once it is released. 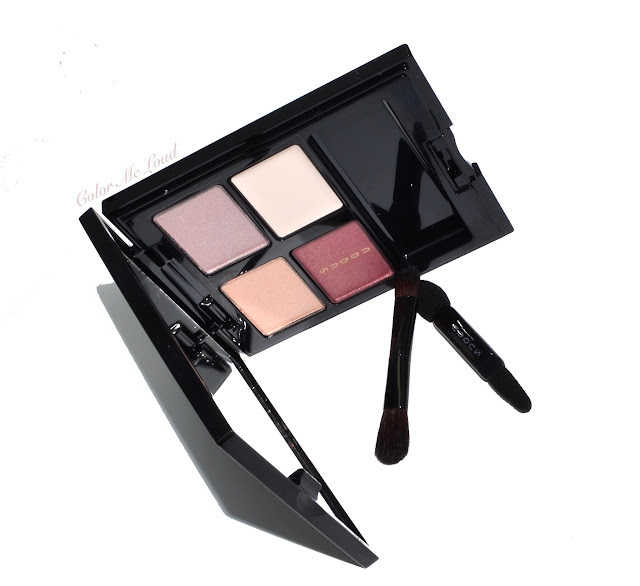 I'm eyeing this one you posted about and also the ex-26 one, so thats handy that you will be reviewing that one as well :) Mind you I want the two cheek products and also all the lipsticks so am hoping I can try to cut the list down! For sure - let me know details or do you trust me to get the right one! This one is simply stunning and I love both the looks you showed here!! That grey shade is gorgeous, I never thought I'd say that about any grey.... definitely need this in my collection! expansive, just 7-8$for cosmetics, palettes are light. All palettes cost 7344JPY it is 53 Euro. If You are interested in something, drop me a line. By the way, Sara, sometimes Suqqu look for their funs, and send good presents for them. I am a Suqqu fan for sure :-) Do you get presents from Suqqu? Japanese are so nice with their customers. sorry for my late replies:( My friend whom I send some SUQQU cosmetics, she got lipstick from SUQQU. She posted photos in net, and they found her! Marvelous Christmas kits will be available soon! 64 Euros. 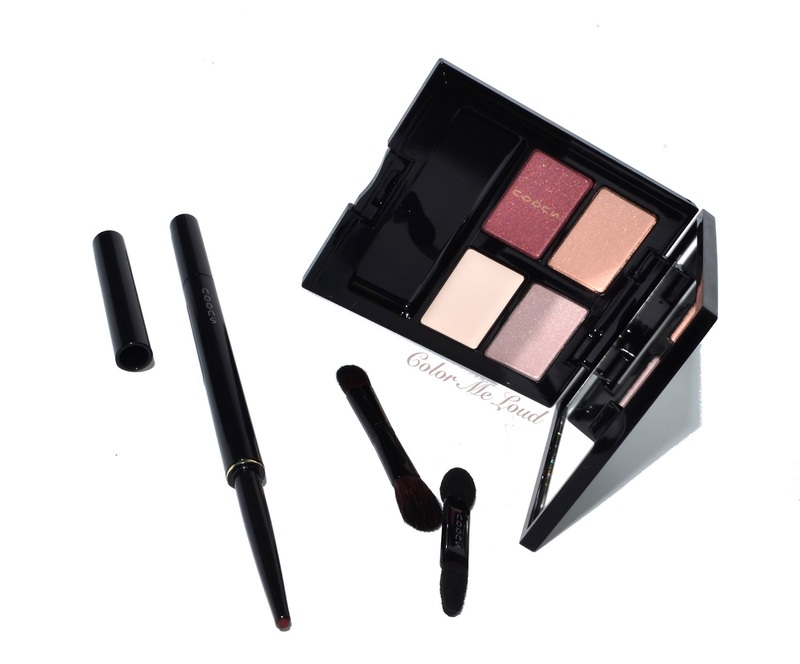 3 colors eye palette, eye liner, 50 ml cleanser, make-up bag. Awesome! 20 is so gorgeous!!! will get this later when I go to japan! !